Collection agencies have an important and significant contribution to the U.S. economy. In part, thanks to debt collection services lenders are more willing to extend consumer credit. This is so because debt collectors act as a type of guarantee that debt can be collected. Not only that, but debt collection also keep consumer prices down, thanks to that same mechanism. With greater access to credit and lower prices, consumers are also able to participate in the economy more fully. And then there are of course all the taxes that collection agencies pay annually – a staggering $2.6 billion on average per year. But starting a collection agency also comes with a lot of responsibilities and obligations. There are many laws and regulations, such as the Fair Debt Collection Practices Act (FDCPA), that collection agencies need to comply with when performing their services. Because debt collectors work with consumers every day, their business is carefully regulated to ensure that consumers’ rights are not violated. Despite that, getting a collection agency license and starting your own business pays off in many ways. As a collector, you may choose to work from your own home as well as to determine the amount of work you want to take up. If instead, you want to open a franchised agency, you will be backed by an established business with a working business model, and you’ll be able to focus on collections. Opening a collection agency is also good for those who consider themselves people persons, who like communicating and who want to develop their soft skills. Last but not least, with about $3.8 trillion in outstanding consumer credit, there are ample opportunities for debt collection in many industries and fields! So what does it take to start collecting debt? Depending on where you live, you may need to comply with several legal requirements, such as to get licensed in your state and obtain a collection agency bond, and you’ll also need to take care of some practical requirements as well. Read on to learn more about how to start a collection agency! When it comes to starting a business, every state has its own set of requirements that business owners need to comply with. Some states may only require you to register your business with the state, whereas in other states you may need to obtain a collection agency license and pass an examination on top of that. Carefully preparing for the process of launching your business is important here, because knowing all the requirements you need to comply with can save you both time and money. You can find out more about the legal and practical requirements to launch your business in Chapter 3 of our e-book about starting your own collection agency! To successfully launch your collection agency, you also need to properly plan for the expenses you will need for at least the first two or three months. These expenses include the money you will need to buy basic equipment such as a computer, a telephone and a toll-free line, office supplies, and more. Expenses also include the money you will need to obtain an initial portfolio of debt to collect as well as costs related to registering your business, getting licensed and bonded, etc. While equipment costs are more or less the same everywhere, licensing and the cost of debt account portfolios can vary significantly. Of the above, the FDCPA is the main act that governs the permissible and prohibited ways in which agencies can collect debt. It also defines consumers’ rights, and what actions they may take if a collector harasses them. Whether, when, and how agencies may call consumers in order to collect debt. On top of these, most states also have their own debt collection laws that further define collectors’ responsibilities and obligations, as well as the conditions under which you may collect debt in a particular state. Being familiar with both federal and state collection laws is essential if you want your business to thrive! See the section on federal and state laws in our e-book for a more detailed explanation of laws you must learn about and comply with when you become a collector! Not all states require collectors to get licensed. Yet, in the majority of states, some form of licensing process is required before you can collect debts. And even if your own state does not require you to get licensed, if you collect debt in other states you may be required to get licensed there. And if you download our e-book, you can find out at a glimpse in Chapter 4 whether your state requires licensing and a surety bond! The collection agency bond is a central licensing requirement in many states. The bond serves as a financial guarantee for agencies’ clients as well as for the state. Both the bond amount as well as the bond conditions vary to a certain extent in each state, though there are several most common conditions shared by collection agency bonds. The amount of this type of bond is determined on a state level and can, in some states, be as high as $100,000, though they are significantly lower in most cases. You can use our surety bond cost calculator to get a ballpark estimate on the cost of your bond. The bond amount is not the same as the bond cost though! To get bonded, you need to pay a bond premium which is a small percentage of the total amount of your bond. When you apply for your bond, the surety which issues your bond will assess your personal credit score but it may also refer to your business and personal financial statements, and your personal assets and liquidity to make a better decision. The higher your personal credit score is, the lower your bond rate will be. Applicants with a FICO score of 700 or more are typically offered the lowest rates on their bonds. Download Our E-book for More Information! Want to know more about how to start a collection agency? 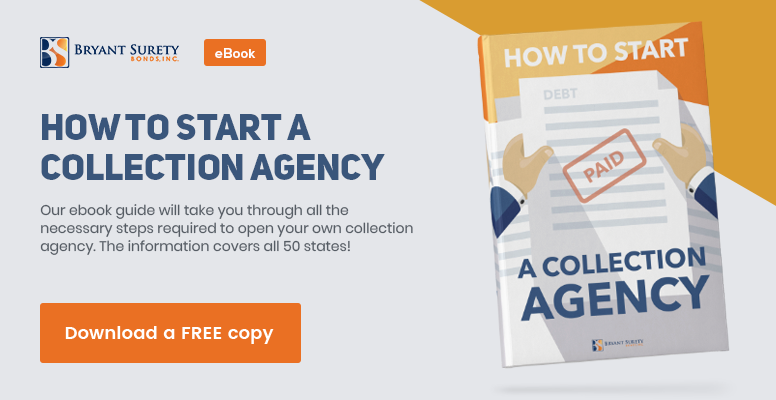 Download our free 50+ pages e-book for an in-depth overview of all the steps you need to take when opening a debt collection agency in your state! Our e-book also features a table with basic information about the licensing and bonding requirements in all states and is the most exhaustive resource to date about starting a debt collection industry. For examples of getting licensed in particular states, you can have a look at our state collection agency licensing guides for Florida collection agencies, Nevada collection agencies, or North Carolina collection agencies!